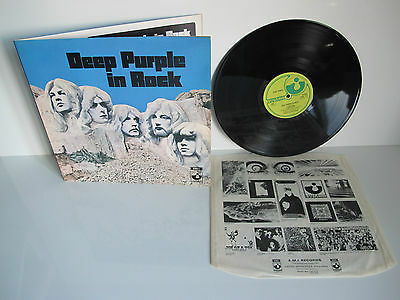 THIS UK LP IS IN STUNNING NEAR MINTCONDITION............ USUALLY FOUND IN POOR CONDITION THIS IS QUITE REFRESHING ! THE GLOSSY VINYL IS IN NEAR MINTCONDITION SHOWING A FEW TINY LIGHT MARKS ONLY ! ...... REALLY A VERY NICE GLOSSY DISC ! DOES NOT APPEAR TO OF RECEIVED MUCH PLAY TIME ! THE CENTER LABELS ARE IN EXCELLENTCONDITION....... NO EMI BOX ON LABELS ! THE AUDIO QUALITY IS STUNNING ...... CRISP AND CLEAR AND GENERALLY SOUNDS LIKE ANY NEWER VINYL ...... NO CRACKLE OR POPPING ....... IT PLAYS NEAR MINT ....... A STUNNING LISTEN !! ! FLAWLESS ! ONE OF THE BEST SOUNDING ORIGINAL VINYLS I HAVE HEARD FOR QUITE SOME TIME ! THE G & L COVER IS IN SUPERBNEAR MINTCONDITION ....... REMAINING VERY BRIGHT AND SUPER GLOSSY LAMINATE FINISH ........ NEAR PERFECT INTERIOR ..... NICE SPINE ...... SLIGHT CORNER BUMPING AND THE ODD CREASE NEAR SPINE EDGE ....... CREASE TO TOP, RIGHT FRONT PICTURED ......... ITS NEAR PERFECT ! THE ADVERTISING INNER SLEEVE IS IN EXCELLENTCONDITION ALTHOUGH CREASED. ANY QUESTIONS WELCOMED ...... ALL RECORDS ARE GRADED AS PER The UK Rare Record Price Guide Grading SYSTEM ...... ALL RECORDS ARE VPI TYPHOON CLEANED AND PLACED IN ANTI STATIC INNER SLEEVES........HIGHLY EXPERIENCED AND PROFESSIONAL PACKAGING IS ASSURED FOR ALL SALES. A1 / B1 PICTURES BELOW. THANK YOU.